I just wanted to put out a reminder that we will be on a story time break this week, February 27th to March 2nd. However, we will have toys available in the Puett Room. So if coming to the library on a weekday is part of your family's routine, please stop by and play with toys!! Our next LEGO Construction Zone will be held on Sunday February 26th, from 1:30-3 p.m. in the Puett Room. 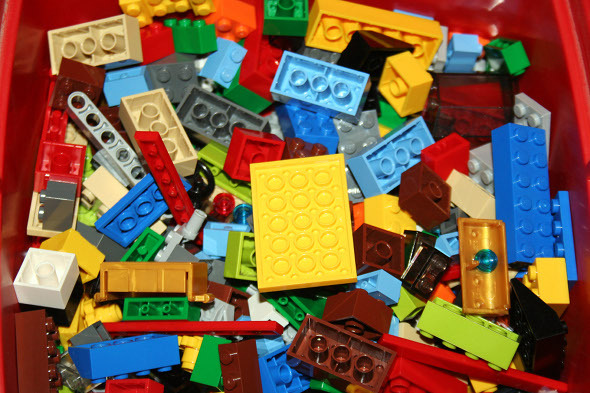 Ages 5 and up are welcome to drop in to work on their own creations with other LEGO fans. We'll supply the building blocks; you bring your creativity! It's gonna be a ton of fun!!! 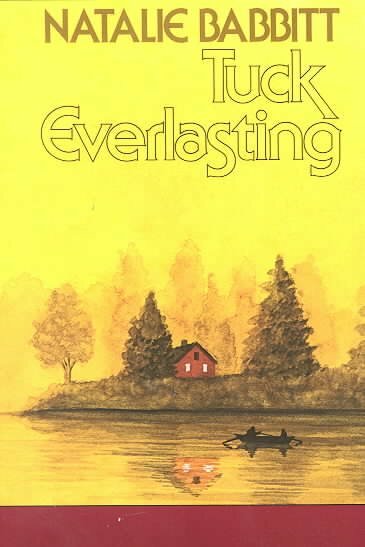 I may as well start this series with my all-time favorite chapter book as a kid: Tuck Everlasting, by Natalie Babbitt. I happened to be in a used book store when I was in elementary or middle school, and the book just looked good. Little did I know what a classic I was getting ready to open. I've never seen the movie myself, but the previews looked so cheesy compared to the book, I can't imagine that the movie did it any justice. In case you don't know, it's a very sweet romance between kids. Jesse Tuck is forever 17, immortal like the rest of his family. Winnie Foster is a little younger, and is very mortal. They fall in love, and Winnie has to make the decision whether to drink from the secret spring of immortal water or live the rest of her life like everybody else in the world. The words that come to mind when I think of this story are tenderness, love, and friendship. I love it as much today as I did as a kid. Friends of the Library Used Book Sale This Weekend! The Friends of the Tigard Library will be holding a used book sale at the end of the month. The Community Room will be packed full of used books, music, and movies...many in mint condition! Hardbacks are selling for $2, paperbacks for $1, kids are books running 20 to 50 cents (what a bargain!!! ), CD's for $2 and DVD's for $3. Be sure to stop by the Circulation Desk and check out some items from the library to get your 50 cent off coupon! Cash and checks will be accepted. Friday February 24, 9 a.m. to 5 p.m.
Saturday February 25, 9 a.m. to 3 p.m.
Our Next Super Tuesday will be held on February 21st! 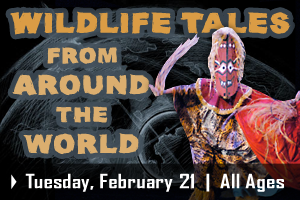 The Mythobolus Mask Theater is a unique troupe that uses dance, masks, colorful costumes, music, and narration to tell animal tales from around the world. Learn about the Makah tale, Clamshell Boy, the African tale of The Jungle Fruit Tree, and the Mexican tale of Prietita. Welcome to our new series of posts called "Favorite Book Fridays"! 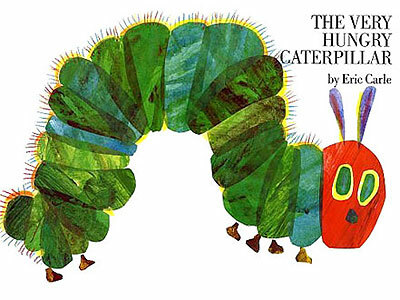 Each friday a youth services staff member will post info about their favorite children's or teen book. It will be really fun to see a wide variety of books posted here. Have You Taken Your Library Survey Yet? We are in the second week of our annual library survey. Have you filled yours out yet? It only takes a few moments. We really want to know what you think of the library and if you have any thoughts or comments on how we can serve you better. The survey is open to all ages and it ends on Saturday February 18th. Click here to take the survey today! Thank you! Thank you for joining us on our journey over the past few months as we looked at all of the collections that are housed in the children's and young adult rooms at the library. We hope you found it informative and were able to learn more about what the library offers young patrons. This week will be our last post in the series as we will be highlighting the Parents Colletion today. Join us on Fridays as we begin a new series called "Favorite Book Fridays" where youth services staff will post their thoughts and comments regarding their favorite children's and young adult books. The Parents Collection is housed in the children's room at the library. We've decided to keep the collection here so parents can browse books for themselves while allowing their children to puruse their own books and play with puzzles, puppets, and our game computers withouth having to leave the room to go upstairs. This is just a sampling of subjects that we carry in the collection. Other topics of interest that are in the collection includes baby signs, family cooking & cook books, first meals, family travel, gardening with children, and green living. Stop by the children's desk today as we would love to show you the collection! The Sports Illustrated for Kids Graphic Novels is a great series for teaching children in grades 2 to 6 about the positive effects of good sportsmanship. The large picture frames display action and the short text encourages reading among reluctant readers. The fast pace and low vocabulary while teaching team building, fairness, and sportsmanship make a great fit. Have your favorite young athlete try one today! Hello and welcome to another (belated) Meet the Collection Monday. Allow me to introduce you to our Young Adult Spanish collection, which lives on the second floor of the library on the shelf with the YA Graphic Novels. The collection consists of, you guessed it, young adult materials in Spanish. 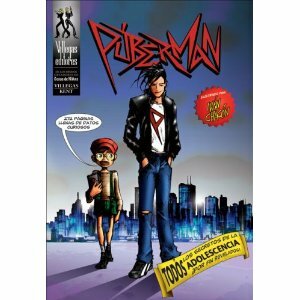 Some are non-fiction like Puberman, a comic book set up to inform boys about what they can expect from puberty. There are also other great informative books about subjects ranging from algebra to Che Guevara. Moving on to fiction, you will find both translations and books written originally in Spanish. 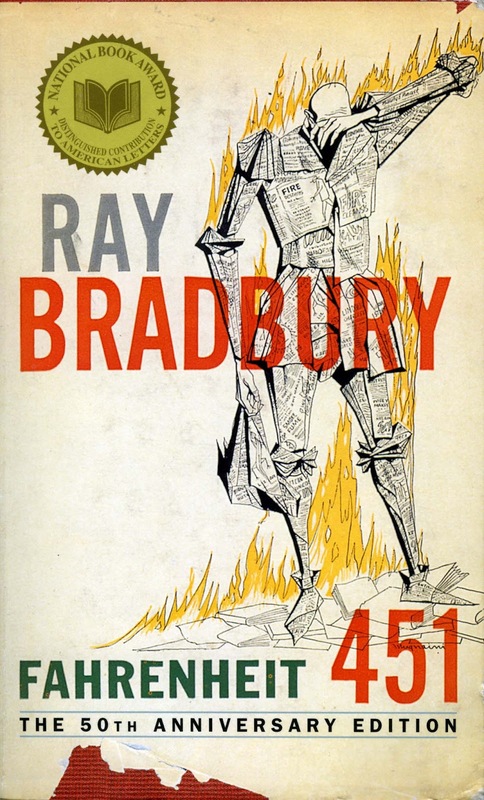 When I select titles for the collection, I look especially for translations of popular teen books like Alexandra Adornetto's Halo and classics that will support high school curriculum and reading lists like Ray Bradbury's Fahrenheit 451. 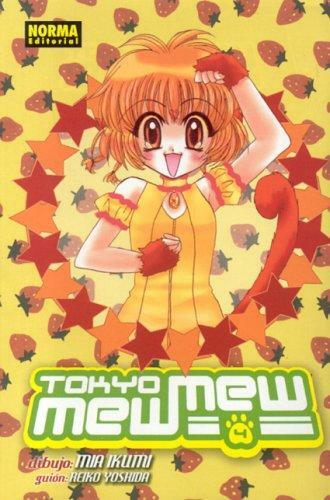 Some of the most popular items in the collection are graphic novels, including translations of Japanese comics like Tokyo Mew Mew and American comics like Hellboy. Come peruse the collection and find the next great book for your Spanish speaking or learning teen! RRRALPH Narrator Andrew Watts cleverly describes how Ralph the dog can talk, appropriately saying words such as "roof," "rough," "bark," and "wolf." Wonder Horse: The True Story of the World's Smartest Horse This fictionalized account of Bill "Doc" Key, a former slave who became a veterinarian, trained his horse, Jim Key, to recognize letters and numbers and to perform in skits around the country, and moved the nation toward a belief in treating animals humanely as narrator Kevin R. Free tells the tale with loving care. The Django A young boy named Jean has an imaginary friend, Django, who keeps getting him in trouble and eventually is sent away, but whenever Jean plays the banjo he continues to feel close to Django. Inspired by the life of jazz musician Django Reinhardt; includes facts about his life, which includes one of his hit songs following the story narration. Who Stole Mona Lisa? Skilled narrator, Barbar Rosenblat voices the famous Mona Lisa painting as she is stolen from the Louvre in Paris and her terror of her unknown future. Here Comes The Garbage Barge! In the spring of 1987, the town of Islip, New York, with no place for its 3,168 tons of garbage, loads it on a barge that sets out on a 162-day journey along the east coast, around the Gulf of Mexico, down to Belize, and back again, in search of a place willing to accept and dispose of its very smelly cargo. Who would have known that one town could accumulate so much trash? Interrupting Chicken This 2011 Caldecott Honor Book is now available as a read-along. Papa is reading Little Red Chicken bedtime stories, but Little Red keeps interrupting and making up is own stories in this hillarious bedtime tale.